The ford, which was located slightly upriver from this location, was used until 1832 when the bridge was erected. Across the river and half a mile down from here was Thomas Millard’s grist mill. In operation by 1713, it was the only one that serviced the Oley Valley region for several years. 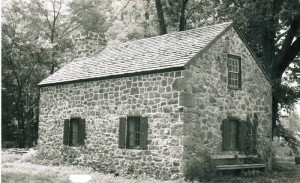 Since a grist mill was located so close to the ford, the area was a popular crossing spot. Eventually, the property became the home of the custodian and toll-keeper of the double lane Douglassville covered-bridge which crossed the Schuylkill River at this location. It was the job of the custodian to light and hang lanterns on each end of the bridge and, in winter, to shovel snow into the structure so that the sleighs could run more smoothly. The caretaker was paid by the county and was also required to sweep out the interior each night. Prior to an explanation of the Douglassville Covered Bridge, it is important to understand how the bridges were put together. Bridges were covered to protect their wooden members or supporting beams. Once covered, the interior supporting beams were protected from the elements and this theoretically extended the life of the bridge. The strength of the bridge depended on the wood being seasoned except for the arch which could be slightly green. Only heart wood was used for supporting timbers. The quality of workmanship was as important as the quality of the wood. All the individual pieces and members of the bridge including the side boards would be cut and fitted in a nearby field prior to being inserted into the structure itself. The construction of the bridge was taken on by the Douglassville Covered Bridge Company of which George Douglass, Jr. was a commissioner. The Douglassville Covered Bridge Company was a stock holding enterprise. The Douglassville Bridge was one of twelve covered toll bridges in Berks County. This bridge was a private enterprise and was not run by the county. The bridge was 340 feet long, 24 feet wide, had two lanes, and had two spans meaning there was a support pier midway across the river. The road from this bridge led onto the King’s Highway. The King’s Highway is modern-day Old Philadelphia Pike. Also, the road that led to the bridge (today’s lane to the Mounce Jones house) apparently followed an eighteenth century property line. On September 2, 1850, a flood damaged the bridge to the point that it had to be rebuilt. This 1850 flood washed away every bridge over the Schuylkill River from Pottsville to Royersford when the river rose twenty-five feet. When the Klapperthal Dam was breached, a canal boat broke loose and floated down stream and eventually rammed the northern span of the Douglassville Bridge, carrying it away. The Douglassville Bridge Company contracted Messrs’ McKently and Linderman to rebuild the bridge. They bought what was remaining of the Lancaster Bridge span at a cost of $1,600. In 1851, the bridge was rebuilt using one span from the Lancaster Bridge which had been washed down river to a meadow near Douglassville in the same flood that ruined the Douglassville Bridge. The Lancaster Bridge had been located at Bingaman Street in Reading. The washed away portion of the Douglassville Bridge was used to replace a span at Kenilworth in Montgomery County. Scarcity and high prices of lumber was a burden in repairing bridges. The Douglassville Bridge was the second bridge to be rebuilt in the county after the flood. 1 cent/foot passenger, 6 cents/20 sheep, 10 cents/20 swine, 20 cents/20 cattle, 4 cents/horse or mule, 6 cents/horse with rider,12 1⁄2 cents/sulky and horse, 25 cents/carriage with 2 horses, 37 1⁄2 cents/carriage with 4 horses, 20 cents/stage coach with 2 horses, 30 cents/stage coach with 4 horses, 6 cents/sleigh and each horse, 5 cents/draft sleigh and horse, and 6 cents/wagon or cart and horse. The bridge was bought from the Douglassville Bridge Company in 1885 by the county for $9,000. In 1886, the bridge was made free of tolls. In 1902, yet another flood damaged the bridge. During this flood, the river rose 24’ 6”. Then, in 1909, the original pier was taken down and replaced by a new one at a cost of $4,100. In 1930, the bridge began to sag and lean downstream, so it was closed to vehicular traffic but remained open to pedestrians. A March 1, 1946 Reading Eagle article announced that the bridge would be replaced by a concrete span. Cables were attached from the bridge to posts and trees to help strengthen the bridge and keep it from collapsing. The new steel and concrete bridge cost $400,000 to construct. The covered bridge was last used in 1951 and was torn down in the same year. Prior to being razed, the Douglassville Covered Bridge was the last wooden bridge spanning the Schuylkill River. 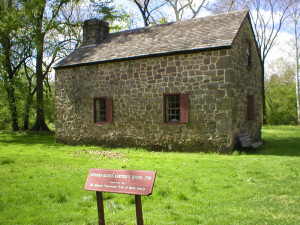 Located adjacent to the Mounce Jones house, it is a 1½ story sandstone structure with a single interior-end chimney. It is a one-room building with a relatively large open attic space. However, the house apparently contained four rooms at some point. Unlike the Mounce Jones house, this property still has a full basement. 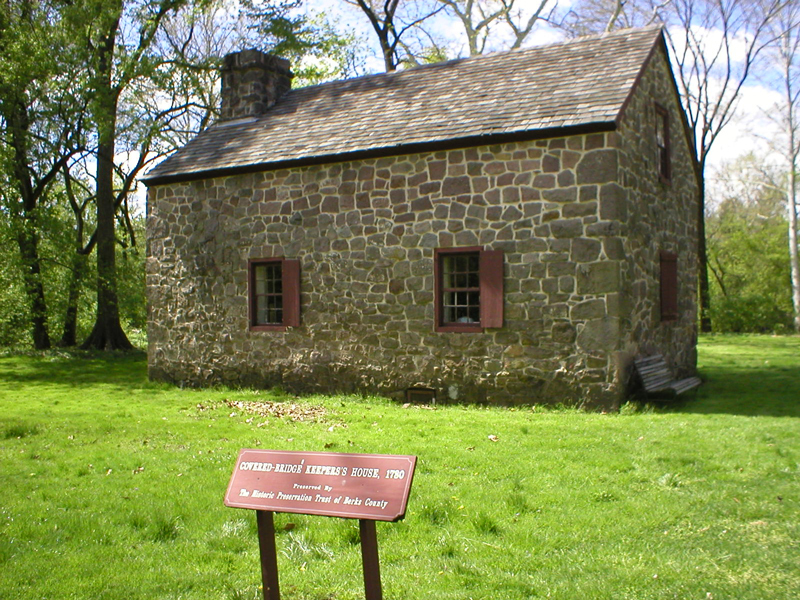 Originally part of the property which Mounce Jones had, the land eventually passed to George Douglass and George Douglass, Jr. The house has been vacant since 1957. The Schurr family acquired the house and one acre and sixteen perches from the George Douglass estate. 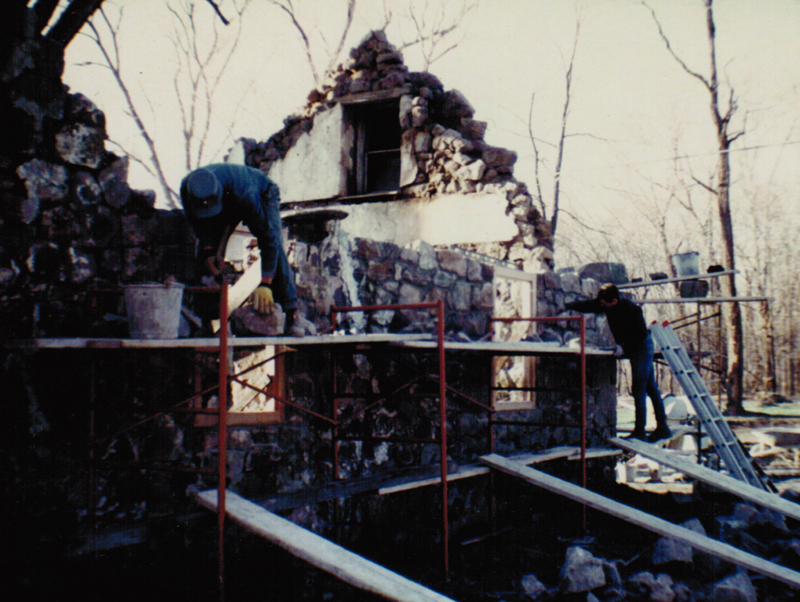 The Historic Preservation Trust of Berks County acquired the property in 1965 at the same time that the Mounce Jones house was acquired. Interested in learning more about the Covered Bridge Keeper’s House and the Historic Preservation Trust of Berks County? Search records, pictures, images, architectural drawings and more in our Online Archive.